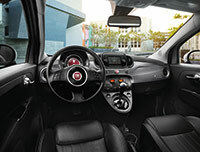 The Fiat 500 offers character in place of spaciousness, Italian charm in place of performance. Under the hood, though, the new turbocharged base engine delivers 33 percent more horsepower than its non-turbo predecessor. Essentially, it’s the same 1.4-liter four-cylinder engine installed in 2015-16 Turbo models. Except for a new spoiler, side-sill ground effects extensions, and body-colored front/rear fascias, the 500 hatchback and Cabrio haven’t changed sharply in appearance for the 2018 model year. In fact, they still look quite similar to the original 2012 version, a modern rendition of the Fiat 500, or cinquecento, that debuted in the 1950s. New 16-inch aluminum wheels are mounted. A rearview camera is now standard, as are foglamps and a sports suspension. 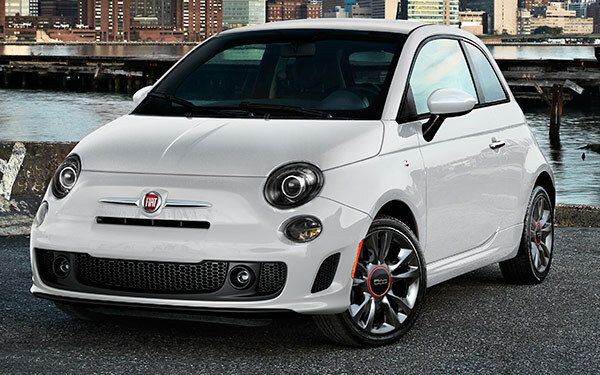 As before, the Fiat 500 comes in Pop, Lounge, and Abarth trim levels. Each has front-wheel drive and is offered either as a hatchback or a Cabrio, the latter featuring a power-folding fabric roof. Standard in Pop and Lounge models, the new base engine develops 135 horsepower and 150 pound-feet of torque. Although the power increase is most welcome when merging or passing, the lower-powered 500 doesn’t quite qualify as sporty. That’s the goal of the Abarth edition, packing a free-breathing, 160-horsepower version of the 1.4-liter turbo four, developing 170 pound-feet of torque. (With automatic, output drops to 157 horsepower, but torque reaches 183 pound-feet.) Both engines mate with either a 5-speed manual gearbox or a 6-speed automatic transmission. Crash-test results are troubling. Last year, the National Highway Traffic Safety Administration gave the 500 a four-star rating overall and for frontal impact, with five stars for side-impact. For 2018, the agency gave the hatchback a four-star frontal score, but no ratings overall or for side-impact. The Insurance Institute for Highway Safety gave the 2017 model’s driver’s side a Poor rating for small-overlap frontal crash protection. No rating was issued for the passenger side. In side-impact and moderate-overlap testing, the 500 earned Good scores. The newly standard rearview camera is most welcome on Cabrios, which suffer dismal rearward vision when the roof is down. Advanced safety features, such as automatic emergency braking and active lane control, are unavailable.